Boasting over 150,000 customers, Goose VPN is one VPN service that is backed by venture funds. Read on to see if the investors have made the right decision in investing in this company. Goose VPN is easy to use thanks to a user-friendly interface that makes it accessible almost anywhere. It’s no wonder why Goose VPN has over 150,000 users across 8 different platforms. 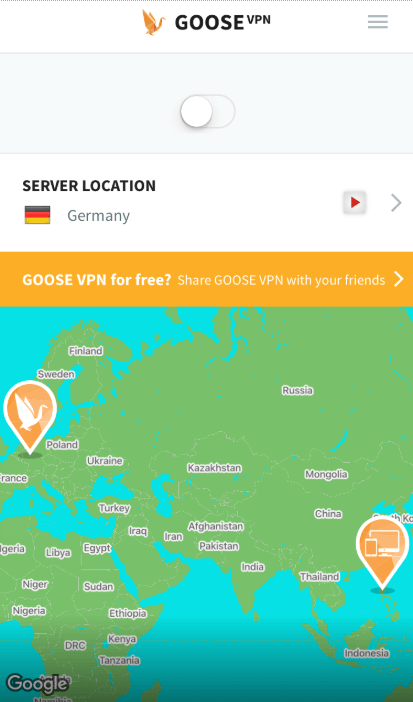 In this review, we tested out how good Goose VPN is, and if it’s really worth a shot. Oh, and we also make a LOT of Top Gun references (Goose fans, unite!). Strap yourself in! After running tests using ipleak.net and dnsleaktest.com we found that Goose VPN’s IP address and DNS servers had no leaks! Encryption and Protocols: Turn and burn! Goose VPN employs the industry standard AES-256 encryption. This is one of the safest types of encryption currently available. It’s virtually hack-proof. As for protocols Goose VPN uses IKEv2, LTP/IPSec, PPtP, and OpenVPN. IKEv2 is a high-speed protocol which works best on newer devices but is easily blocked. Despite flaws, it’s still Goose VPN’s standard high-speed protocol and it’s supported on almost every device. LTP/IPSec is an average protocol with normal speed that works with devices, particularly routers and modems. PPTP is almost the same as LTP, but with average security. It’s a bit older than LTP which makes it great for older devices too. OpenVPN is a connection that’s great for its quality and it’s difficult to block. It looks just like a normal HTTPS connection. This makes it hard to be distinguished from an actual HTTPS. Kill Switch: Fire, Maverick, fire! As a latest added feature Goose VPN now offers a kill switch. The kill switch ensures that no data is sent unprotected. Meaning you can maintain your anonymity even if the connection to the VPN server disconnects. For now, the kill switch is available for Windows. On iOS it’s labeled “VPN Always On” for some reason. The industry agrees it’s called a kill switch, so we’re left wondering why they decided to go this route. Goose VPN’s sports a handful of servers that are compatible with Netflix. Hello, region-restricted TV shows! Since 2016 Netflix has been blocking access to VPNs. Goose VPN’s continuous compatibility with Netflix is a point in its favor. Specialty streaming servers sporting a play button will give you access to Netflix, regardless of restrictions in your country. However, if you’re looking for the most reliable VPNs to accommodate your binge sessions, it’s worth taking a look at our top recommendations for VPNs that work with Netflix. In this case, the NL server is P2P-enabled. Goose VPN doesn’t have a specific policy or restrictions regarding torrenting or P2P. The company highlights both as a feature. Simply select the servers with the “P2P” symbol next to it. According to the Goose VPN website, your downloads will not be tracked. Although, Goose VPN does a fair use policy; it states that users will be limited when they utilize more than 1% of the network’s bandwidth. Keep in mind this is quite a bit of bandwidth. The policy reassuringly states that this has never happened. Even though this is reassuring, you can never be too careful with torrenting. This is why we compiled a list of the best VPNs for torrenting. They’ve all been tried and tested over time, so we can vouch for them with more confidence than Goose VPN. Goose VPN features unlimited connections for different devices. It’s a welcome feature that one account can be used across multiple devices. This VPN is available on Windows OS, Mac OS, iOS, Android, and for various routers. You can also set up manual configuration on other platforms like Linux, Synology OS, Chrome OS, and Raspberry Pi 3. Goose VPN has a 100% no logging policy, meaning they don’t save any user information. Users are guaranteed their privacy and a secure browsing experience without worries. Although— in compliance with the law—Goose VPN holds at their discretion, the right to log any user information when that user is suspected of using the application for criminal activities like terrorism. 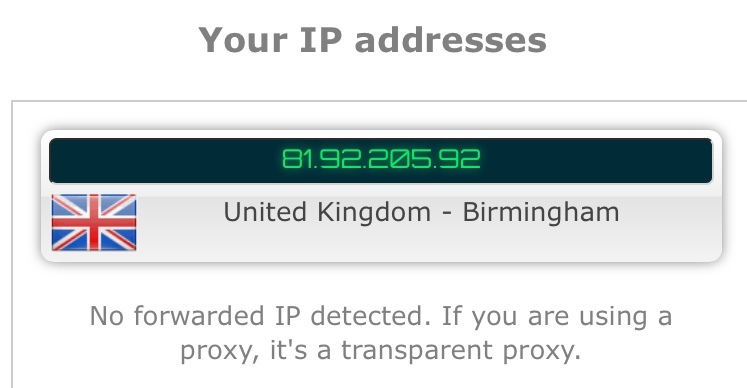 Also, just so you’re aware, Goose VPN does retain one data point; that being the bandwidth of each user’s account. A fair and harmless collection. Product Documentation: Talk to me, Goose! Goose VPN features a section for FAQs/Support both on their website and within the application. The section also sports a search bar so you can type in your questions or keywords, making it easy enough to find an answer to your question. Creating an account for Goose VPN is quick and easy especially thanks to its user-friendly interface. If you download the app on your phone it will show you three slides. Each features brief information about the software. At the bottom of the screen, you will see a “Create Account” link. All you have to is click that button. Goose VPN asks for your name and email. 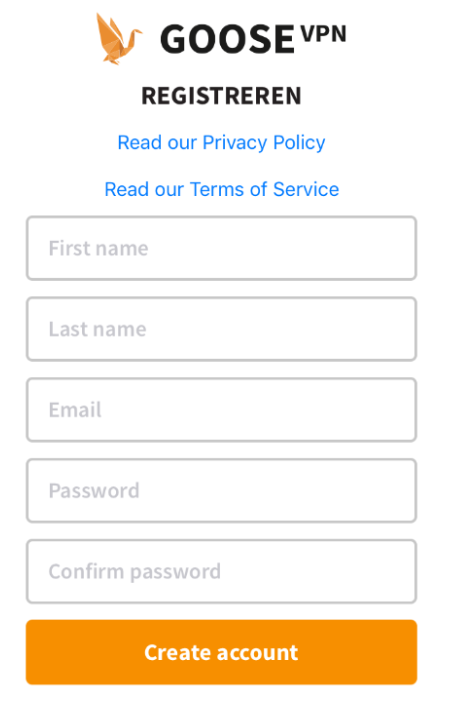 Fill in the required information to continue signing up. The app will then load to another screen asking you to choose your subscription plan. For Windows and other users, the app will lead you to another screen asking for your payment method and payment information. 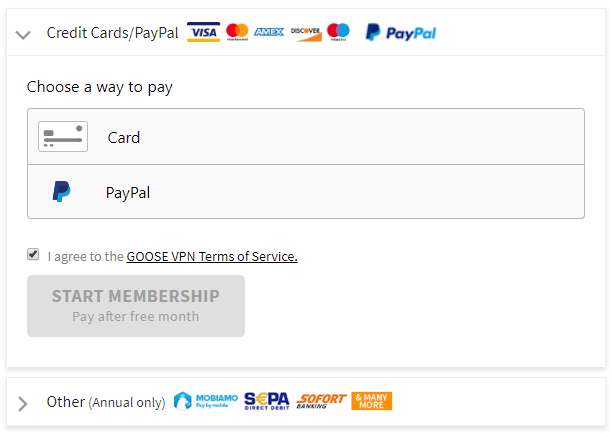 Although you’re signing up for a free trial, Goose VPN still asks for your payment info. Don’t worry! They won’t charge you until your free trial ends. Product Interface: You can be our VPN wingman anytime! 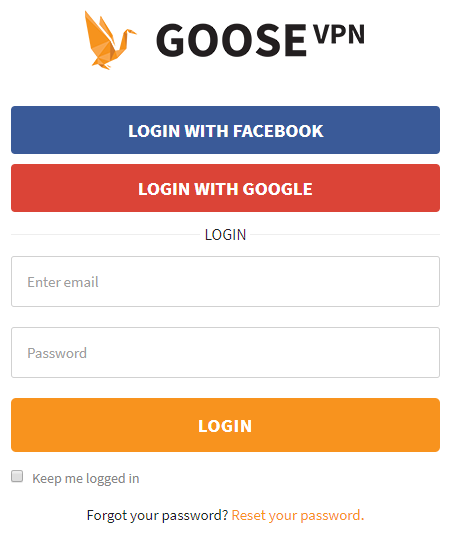 Create an account with Goose VPN. Select the server you want to use and connect. As you can see, they also mark whether the servers are streaming or torrent-friendly. Goose VPN currently has 114+ servers in 38 countries, with a handful of servers dedicated for P2P (downloading) and media streaming. With this number of servers across Europe, America, and Asia users have little to no difficulties accessing blocked websites and geo-restricted content. We’d definitely like to see more servers, however. C’mon Goose, highway to the danger zone! When it comes to hands-on testing Goose VPN’s speed is not impressive. Our results found a range between 2 to 40 Mbps, depending on where the server is located. The farther the server is from the user the slower the connection. We recommend trying out different servers to see where you’ll get the best connection. Goose VPN offers a 30-day free trial. It can be canceled anytime, which makes it a very inviting VPN to try out. If you’re not satisfied make sure to cancel before your trial ends or you will be billed. You are also able to cancel your subscription anytime. However, Goose VPN’s policy states that canceled accounts will not be refunded the remaining service period. For example, if you canceled in the middle of the month then don’t expect to get your money back for that current month. New Goose VPN accounts are given a 30-day money back guarantee if they have used less than 100 MB of data—and the user is still in their trial period. Users who exceed 100MB during their trial period are not guaranteed their money back if they cancel. At that point, refunds are at the discretion of Goose VPN management. Goose VPN does also issue refunds if users experience technical problems due to over-used bandwidth. A monthly 50GB data allowance worth $2.99. An unlimited data allowance per month worth $12.99. An unlimited data allowance to be paid annually worth $59.88 (or $4.99 per month). For those who consume a lot of data every month the annual plan should be perfect. It saves users up to 62% of the normal monthly price. But if you’re only dipping your toes into the world of VPNs then Goose’s offer of $2.99 for a 50GB data allowance per month will work. Heavy data users who don’t like annual relationships should opt for Goose VPN’s $12.99 per month plan for unlimited data. You can pay with credit cards such as Visa, American Express, Mastercard, etc. or you can use PayPal. If you opt into the annual data plan you can also use payment methods like MINT—an annual prepaid card system—or iDeal. 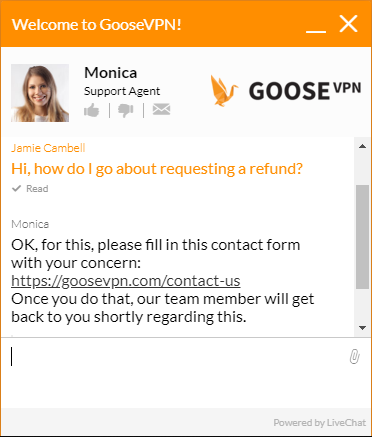 Goose VPN offers live chat and email support both on desktop and phones. Having lots of options is just great. We tried using the live chat option. A customer support agent responded quickly. However, the agent only offered answers for generic questions. After two to three questions we were told to email Goose VPN support instead. Customer support by email is fairly slow. It took more than a day to receive an answer, but the support staff resolved the issue soon enough. One minor thing we would like to see, though: it would be nice to receive a simple automated email letting us know that Goose VPN had received our request. In fact, they’re looking into this option right now. That’s a bold mission, Goose! Goose VPN’s underlying principle is “An accessible VPN provider who really listens to its customers.” It is the first Dutch player on the VPN Market operating under Goose B.V., and it’s working towards becoming a big player in the industry. The story goes that Goose VPN started with the thought that VPN providers don’t often listen to their customers. Especially to those with little technical knowledge. This led to the founders creating Goose VPN, an accessible VPN to everyone. Which explains their user-friendly interface too. Goose B.V. recently received an injection of 1 million euros from the Dutch investment firm Treasure Beheer B.V. Goose B.V. is located in Rotterdam, Netherlands. The Netherlands is part of the Nine Eyes alliance along with countries like Denmark and Norway. Although this shouldn’t rule out Goose VPN, it’s something to consider. Goose VPN Conclusion: Do you have that loving feeling yet? Goose VPN is a straightforward VPN. It’s easy to set up and use, making it perfect for users just starting out with VPNs. Customer support could use a little tune-up. And the monthly payment plan for unlimited data should ideally be cheaper. Still, Goose VPN touts multi-device compatibility and servers across 38 countries. Each with a fairly fast unlimited connection protected by 256-bit encryption. And who can forget that some servers offer access to Netflix? Goose VPN is a service that’s well worth trying to see if it meets your needs. Oh, and if you got bored of the Top Gun references, we’re sorry – we’re kicking our editor out of the door as we speak. All the same, choosing a VPN can be a tricky process, so we recommend reading our top 10 list before you make your choice! + Compatible on multiple devices. - Customer support needs a small tune-up. - Monthly billing is a bit expensive.